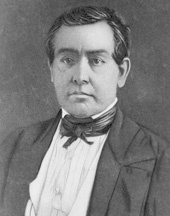 CORWIN, Thomas, (cousin of Moses Bledso Corwin and uncle of Franklin Corwin), a Representative and a Senator from Ohio; born in Bourbon County, Ky., July 29, 1794; moved with his parents to Lebanon, Warren County, Ohio, in 1798; studied law; admitted to the bar in 1817 and commenced practice in Lebanon, Ohio; prosecuting attorney of Warren County 1818-1828; member, State house of representatives 1822-1823, 1829; elected as a Whig to the Twenty-second and to the four succeeding Congresses and served from March 4, 1831, until his resignation, effective May 30, 1840, having become a candidate for Governor; chairman, Committee on Public Lands (Twenty-sixth Congress); Governor of Ohio 1840-1842; unsuccessful candidate for reelection in 1842 and declined to be a candidate for the nomination in 1844; president of the Ohio Whig convention in 1844; elected as a Whig to the United States Senate and served from March 4, 1845, to July 20, 1850, when he resigned to enter the Cabinet; appointed Secretary of the Treasury by President Millard Fillmore 1850-1853; elected as a Republican to the Thirty-sixth and Thirty-seventh Congresses and served from March 4, 1859, to March 12, 1861, when he resigned to enter the diplomatic service; chairman, Committee on Foreign Affairs (Thirty-sixth Congress); appointed by President Abraham Lincoln as Minister to Mexico 1861-1864, when he resigned; settled in Washington, D.C., and practiced law until his death on December 18, 1865; interment in Lebanon Cemetery, Lebanon, Ohio. Dictionary of American Biography; Morrow, Josiah. Life and Speeches of Thomas Corwin: Orator, Lawyer, Statesman. Cincinnati: W.H. Anderson and Co., 1896; Graebner, Norman A. Thomas Corwin and the Sectional Crisis. Ohio History 86 (Autumn 1977): 229-47.